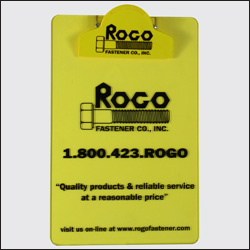 The price of this clipboard includes 1 color imprint on the round top clip. With opaque clips, we recommend contrasting color clip & board. Round Top Clip Size: 3 1/4" x 5 3/4"
Round Top Clip Imprint Area: 1" x 5 1/4" and 1 1/4" x 2 3/8"
Board Size: 9 1/8" x 14" x 5/32"
Front Imprint Area: 8 5/8" x 10 7/8"
Back Imprint Area: 8 5/8" x 12 1/2"
Minimum order is 60 units with a $40.00 less than minimum fee.